Dr. Chidi Achebe, physician executive and the son of the late Chinua Achebe, renowned African author of the novel Things Fall Apart and other distinguished works, will present two lectures on Wednesday, Feb. 21, 2018, at Penn State Berks. The first is part of the Global Studies Forum, titled “Investment in Nigeria” at 12:15 p.m. in the Perkins Student Center Multipurpose Room. The second is part of the college’s Arts and Lecture Series, titled “Inequalities in Health Care in the United States: Why We Should Care” at 7 p.m. in the Perkins Student Center Auditorium. Both lectures are free and open to the public. Dr. Achebe earned his medical degree from Dartmouth Medical School, his M.B.A. from the Yale University School of Management, and a master of public health degree from the Harvard School of Public Health. He is an advocate for health care equality. For his efforts in bridging health care disparities, Dr. Achebe was awarded the 2012 Dartmouth College Martin Luther King Award. 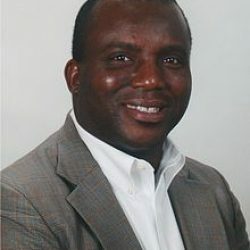 He is currently the president and CEO of African Integrated Development Enterprise. In addition to the two public lectures, Dr. Achebe will also lead a discussion in Dr. Thomas Lynn’s “Literature and Empire” course, where he will talk about the life and work of his father, Chinua Achebe. The presentation will be held in the Franco Building, room 151, and there will be 12 open seats for those interested in attending. Seats must be reserved in advance by emailing Lynn at [email protected]. Lynn, Associate Professor of English at Penn State Berks, published a book in 2017 titled Chinua Achebe and The Politics of Narration: Envisioning Language (Palgrave MacMillan). The book examines vital intersections of narration, linguistic innovation, and political insight that distinguish Chinua Achebe’s fiction as well as his nonfiction commentaries. Chinua Achebe (1930-2013) was a novelist, poet, professor, and critic from Ogidi, an Igbo village in Nigeria. His first novel, Things Fall Apart, is the most widely read book in modern African literature. Published in 1958, Things Fall Apart is a classic of world literature and required reading for many students, including Lynn’s, selling more than 10 million copies in 45 languages. It was inspired by the history of Achebe’s own family and his fellow Ibos who were victimized by the racism of British colonial administrators and then by the brutality of military dictators from other Nigerian ethnic groups. However, Lynn said that Achebe also acknowledged some benefits that colonialism brought to Africa. The presentation “Inequalities in Health Care in the United States: Why We Should Care” at 7 p.m. in the Perkins Student Center Auditorium is part of the Arts and Lecture series. For more information, contact the Office of Campus Life at 610-396-6076.